It’s the day after Christmas and many of you may still have food on your minds. 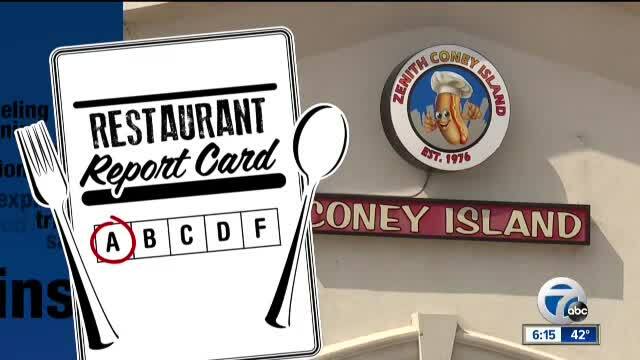 So, in this week's Restaurant Report Card, we look back at some of the eateries that were not quite up to par over the past year. (WXYZ) — It’s the day after Christmas and many of you may still have food on your minds. So, in this week's Restaurant Report Card, we look back at some of the eateries that were not quite up to par over the past year. We wanted to know if those cookeries have cleaned up their act or if they're still subject to dirty dining. Action News Reporter Andrea Isom hit the road to find out if you should chow down or put that fork down! You know, there are always those restaurants that stand out, for good reasons and for bad reasons too! Well, we checked back on some of the ones that received a thumbs down but would now get a thumbs up! Just like my hair, a lot can change in a year. I've been bopping around a bunch of places throughout metro Detroit, searching through hosts of health inspection reports. All this to let you know which spots came out on top and and which ones did not! This time we went to a Coney Island in Howell, a popular Asian place in Novi. Plus, a mom and pop spot in Southgate. You made be surprised by what we found! Check it out!